AUTHORS: Peter Nugent et al. Those watching the sky in August may have heard the news that a new star had appeared. 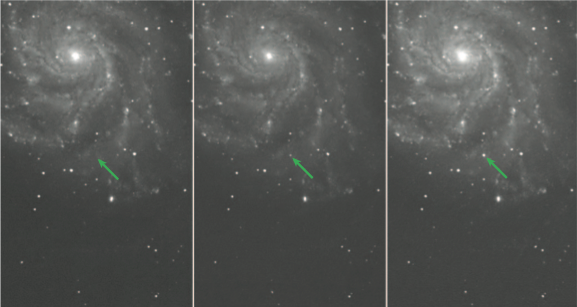 The type Ia supernova PTF11kly (later rechristened SN2011fe) had touched off in M101, the Pinwheel Galaxy, a bare 6.4 Mpc away; close enough that for a brief period the supernova was visible to anyone with a good pair of binoculars. As the closest recent type Ia observed, the event has a lot to teach us, and astronomers will be studying it for decades to come. It has already yielded two papers of great interest, both published as Letters to Nature this week (with longer versions available on the arXiv). We’ll be covering both of these papers on astrobites, one today and the other tomorrow. The first of these papers deals with the supernova itself, and describes the first direct observational constraints on the progenitor of a type Ia supernova. A type Ia supernova differs from the usual core-collapse scenario (types Ib, Ic, and II) in that it is not the final death of a massive star that has exhausted its fuel, but rather the induced detonation of a white dwarf that has accreted mass up to the Chandrasekar limit of approximately 1.4 solar masses (alternate models exist that produce a sub-Chandrasekar-mass detonation, but we’ll set them aside for the duration of these articles). The traditional model of a Ia progenitor system consists of a binary system composed of a carbon-oxygen white dwarf and a red giant or other massive star, close enough to each other that the white dwarf can siphon off material from its companion. This material builds up until the white dwarf reaches the Chandrasekar limit, when the electron degeneracy pressure that has held up the white dwarf until now can no longer support it, and the star begins to collapse. Carbon and oxygen begin to fuse explosively, and a detonation wave – a burning front that moves supersonically – destroys the entire star in a matter of seconds. The initial transient that was to become SN2011fe was detected by the Palomar Transient Factory at 0359h UTC, or about 1959h Pacific Standard Time, on August 24th (August 23rd in California). The same area had been surveyed the previous night down to a limiting magnitude of 21.5, finding all objects brighter than this limit and giving us a firm boundary on when the supernova must have gone off. The data were processed and an alert sent out to the PTF consortium only 16 hours later. The NASA Swift satellite and the robotic Liverpool Telescope in the Canary Islands were both immediately retasked to carry out early-time observations of its spectrum. These data allowed astronomers to classify the event as a type Ia supernova (no hydrogen lines, strong silicon lines) and an Astronomer’s Telegram was issued announcing the event at 2347h UTC – just 20 hours after the first observation. The Kast low-res spectrograph at Lick Observatory, as well as the HIRES spectrograph at Keck I, were both trained on the supernova within eight hours of the telegram’s appearance. 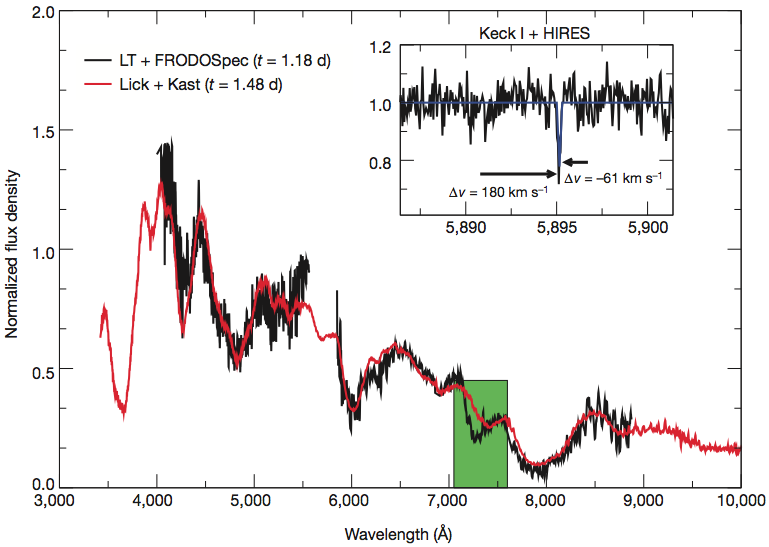 These early-time spectra and observations from the very beginnings of the supernova have allowed the authors of the paper to make two interesting announcements: one, the first measurement of high-velocity oxygen absorption in the early spectrum of a Ia, and two, the first solid constraints on the size of the progenitor star. The ejecta seen in the early spectra are moving at the high velocities typical of a supernova – 15,000 – 20,000 km/s – and the earliest spectra show evolving O I absorption, indicating the presence of some thin layer of remnant material from the destroyed white dwarf caught up in the blast wave. Measuring the initial radius of the progenitor requires knowing three things: the early luminosity, the early velocity, and the time since explosion. At very early times, some of the luminosity of the outer layers of the ejecta comes from shock heating that produces radiation, not radioactive decay. This luminosity drops off as L ∝ E/td, where E is the internal energy from radiation of the ejecta and td is the diffusion time (the radiation travels by diffusion) through the expanding remnant. The internal energy from radiation E drops off as R0/vt , where R0 is the initial radius of the progenitor, v is the ejecta velocity, and t is the elapsed time. Thus, the early-time luminosity is proportional to the initial radius R0. To find the time since detonation, the astronomers must know when the supernova exploded. To do so, the astronomers used the fact that they were able to image the original fireball produced by the event during a time when its luminosity evolution was being governed largely by expansion – as the fireball expands, it dims because its surface area is increasing. The luminosity therefore drops as 1/r², and assuming a constant velocity v, this r goes with vt, where t is time since detonation. Thus the authors fit a simple power model to the early photometry where the luminosity decreases as t² (they allow the exponent to vary slightly to account for non-surface area effects) to fix the detonation time at 2011 August 23, 16:29 +/- 20 min UTC (modulo, of course, the 20.8 million year light travel time from M101), meaning that the initial observations caught the supernova just 11 hours after it exploded! The velocity of the supernova at early times can be calculated from the Doppler shift of the absorption lines. The authors use the earliest photometric data point for their luminosity value, and assume that all luminosity comes from shock radiation rather than radioactive decay as a conservative upper limit, since the more luminosity they attribute to radiation, the larger the calculated initial radius will be; using this data, they derive an upper limit on the initial radius R0< 0.1R☉, meaning that the star must have had a radius much smaller than that of our sun. 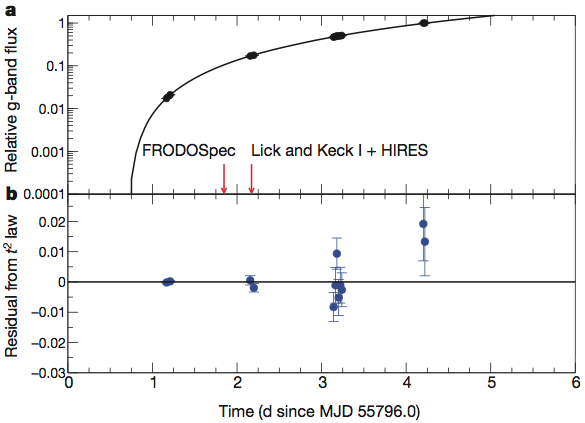 This rules out virtually any other candidate for a progenitor other than a white dwarf, and the presence of remnant C and O in the early spectrum further suggests a carbon-oxygen white dwarf. The authors also use this method to place a few constraints on the properties of the binary system. Because the out-rushing ejecta from the supernova will strike the companion star and shock-heat a portion of it, it will produce extra luminosity in the outer shell. 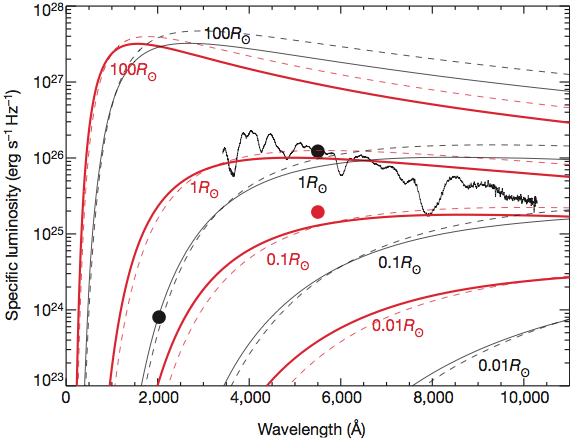 If the white dwarf had had a red giant companion, the authors claim that the early-time luminosity would be much higher than was actually observed, since the shock would have been interacting with the red giant’s extended envelope. Since the additional luminosity seen due to companion interaction changes based on what angle we view the binary from, a main-sequence companion is possible if the binary was viewed farther than 40 degrees off the symmetry axis of the system. 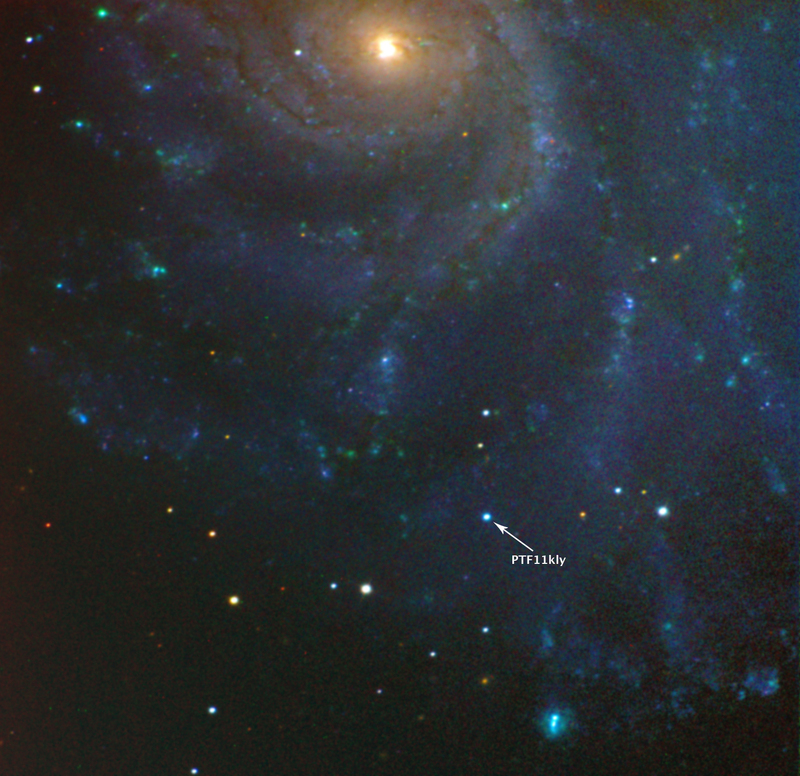 Type Ia supernovae are important to us both as astronomers and as human beings: as astronomers because, in addition to being pretty cool, they follow the Phillips Relation, sometimes called the width-luminosity relation, that allows them to be used as standard candles for measuring distance; and as human beings, because they produce a lot of important nucleosynthesis. Because they are bright enough to be seen from great distances, they are invaluable tools for studying cosmological evolution, and they formed the standard candles that allowed Perlmutter, Schmidt, and Riess to make the measurements of dark energy that led to this year’s Nobel Prize. But for all their importance, and despite all the distant type Ias that have been catalogued, they have proved elusive up close. 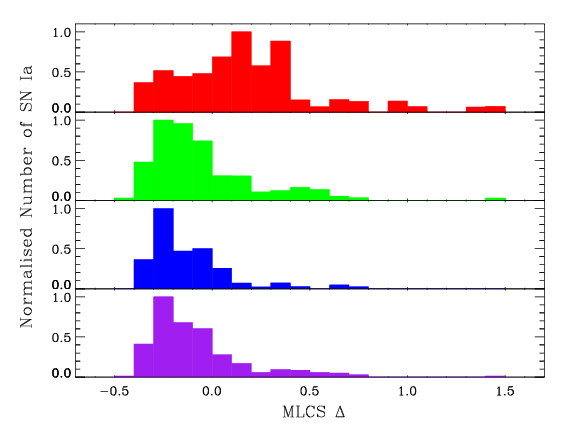 Unlike core-collapse supernovae, of which we have observed a few nearby examples (the most famous of which is SN1987A, which went off in the Large Magellanic Cloud – in cosmic terms, practically under our noses), no type Ia has gone off near us in a time when it could be observed with modern instrumentation – until now. SN2011fe has already proven invaluable for testing and refining our models of these important events, and will surely provide a wealth of data in the years to come. I'm a graduate student at the University of California - Santa Cruz, working with Stan Woosley on simulations of supernovae. In the past I've tinkered with gamma-ray astronomy, galaxy evolution, exoplanet detection, and instrument design. I like supercomputers, aircraft, observing runs, loud techno, and videogames. I am on an unending quest to develop the nerdiest joke in the world. You can find me on Twitter at @GravityAndLight.